In late November, we welcomed a team of ISI inspectors to Worth for a full inspection of educational quality and regulatory compliance. I am very pleased to report that the Inspection found the quality of both the pupils' academic and other achievements and personal development (the two ISI categories of Educational Quality) to be excellent - the highest possible grade – and that the School is fully compliant in all regulatory areas. 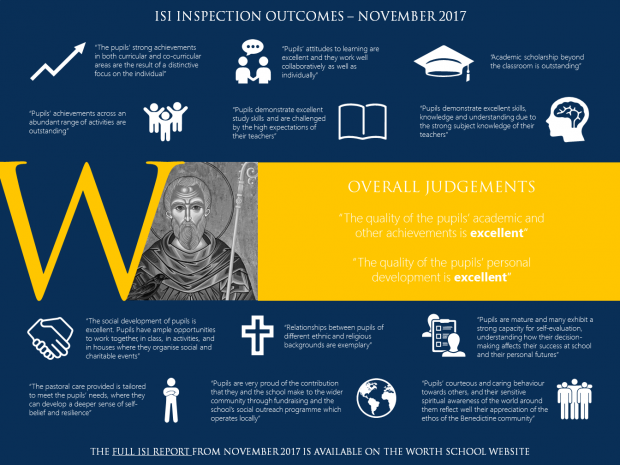 Thank you to all the parents who took part in the online survey, which forms a very important part of the ISI inspection process, and to all who work and learn at Worth, who enjoyed showing the inspectors their school over the three days they were with us. You can find a snapshot of the report here, and the full 2017 ISI Inspection Report here.